Have you ever needed to build a website quickly? Or needed a design element that you just couldn’t make work on your own? How did you solve these problems? For WordPress users a page builder tool can be a lifesaver in any of these instances. Not only does a page builder help you design quickly, it can help eliminate repetitive actions so that you don’t get frustrated with the design process. Here are three reasons a page builder tool, such as WP Page Builder, might be a great option for your next website project. A great page builder comes with all the tools you need to design a website that looks polished and professional. A page builder often allows you to do all of this without writing any code. WP Page Builder is no exception. Start with a template and add elements from the library to design a website that looks like it was created by a professional. You only need a little familiarity with WordPress to really make the most of this tool. The great thing about a page builder is that you can add elements and design techniques that might not be otherwise possible if you have limited coding skills. But this tool isn’t limiting either. If you have some development chops and want to use a page builder for speed and ease of use, everything in WP Page Builder is customizable. You can even add custom CSS to pages or get into even more robust developer options. And everything you do will be ready to publish right away. It’s all optimized for search and works with any theme you might have already installed in WordPress. A tool such as WP Page Builder is a great add-on to speed up design and development while making it all a little less difficult. A solid page builder tool is packed with interchangeable elements that you can add to your website design. Look for a page builder that has a robust set of feature rich tools. Everything is responsive so you’ll know that your website will look great for any user on any device. Plus you can customize every one of the feature-packed elements and save them into your own library to use (and reuse) later. When it comes to building a website fast, seeing changes happen on the screen as you make them is key. A visual, front-end editor provides the ease of use that you need to edit and see the design at the same time. While WordPress doesn’t come with this feature, a page builder plugin such as WP Page Builder adds that functionality without adding a ton of weight to the overall website. 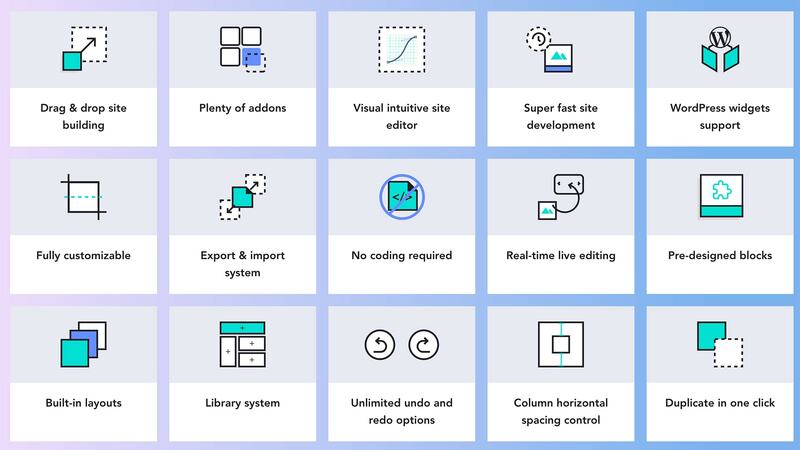 The WP Page Builder editor uses drag and drop tools that you edit right on the screen – no toggling between editor and preview modes. This can help you get a website build faster and control the design. The page builder allows you to drag any design element from the library to the canvas and then change things like color, padding or size and update text and images. You don’t have to deal with rows or divs or any other CSS snippets to get the job done. You can even drag and drop to change the size of individual elements on the screen. Everything happens as you make changes to it … so there’s no guesswork when it comes to the design. And one of the features that might be the best part of using WP Page Builder is the unlimited undo/redo feature. If you change your mind about design options, this is a valuable tool. OK … You’ve probably guessed by now that WP Page Builder is the go-to tool if you want a WordPress page building solution. And the best part is that all these features are available in the free plugin. While some people don’t like to admit it, a page building tool can be a true lifesaver. WP Page Builder can help you get your website up and online quicker and easier. Everything will look great, provide an optimum user experience and is easy to change and customize. This is a premium set of tools in a free package. So what do you have to lose? If you are a WordPress user, download WP Page Builder and try it today.